This is a three dimensional depiction of the parting of the Red Sea. It is currently being displayed at the Museum of Biblical Art in Dallas. I nipped plates, cups, and bowls, to make the waves of the Red Sea. 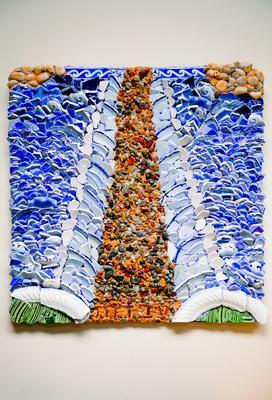 The path was completed at our Passover Seder by placing wet mortar and stones on the mosaic by all of our participants.